I had planned to resist the temptation to write – in considerable amusement – about one of this week’s lighter bits of news; Jonathan Hoffman, perhaps the most limited and narrow-minded Zionist bigot in Britain, is in trouble with the law. The former Chairman of the Zionist Federation of Britain and Ireland (ugh, so vainglorious) and I have crossed swords over social media a few times over the last couple of years, and he is one of the most bullying people I have ever encountered online – worse even than Christopher Whittle. So it was difficult to resist having a written gloat at his troubles. Too difficult, as it turns out, because I have seen a statement about it he put up on his Facebook timeline, and I have to let everyone have a quick laugh at it. Before I get to the guts of my response, is it not hilarious to see a Zionist-imperialist like Hoffman complaining about his coverage in a Zionist-imperialist rag like the Jewish Chronicle? That would not be entirely unlike Donald Trump complaining about Fox News Channel being really harsh on him. Oh yes, original one there, Mr Heffalump, we can be confident no one has ever heard that one before. Even if we give him the benefit of the doubt, it does not explain why Lenszner failed to show up either. Did he ‘not receive his letter’ either? Wow, courier services in this country have really gone downhill since the Royal Mail was privatised by Hoffman’s beloved Conservatives. Urrrggghhhh, apologies for the delay there, I just had to go and be violently sick. He must be, right? This is Jonathan Hoffman complaining about ‘trumped-up charges with zero evidence’?! I mean, seriously – Jonathan Huffing-and-Puffing is complaining about trumped-up charges, with his history of McCarthyite dirty behaviour? He is upset about someone supposedly manipulating legal mechanisms against him, when he reports Labour members to the party’s compliance unit so frequently that he has their phone number on speed-dial? Once again, anyone trying to prove Jeremy Corbyn is one hundred per cent right about Zionists and their total lack of any sense of irony would be wasting effort. Zionists themselves make it absolutely self-evident every day! No, Jimmy Hoffa, you have not been charged for ‘opposing Israel hate’. Opposing hatred of Israel is not a crime – although it could be argued that it should be, given what Israel does to the Palestinians; the Land Day Massacre was a year ago today, and you still try to blame the victims. You have been charged for – or rather with – physical assault and general threatening behaviour. Now, whether you are guilty or not, those are actually against the law in their own right, no matter which ideology – if any – they are carried out in order to advance. If you are innocent of assaulting and threatening people, you will probably be cleared. If you are guilty of assaulting and threatening people, you will probably be convicted. Israel does not enter into this. It is that simple. Having said that, it is a little difficult to believe you are innocent, given your thuggish past, and your loving associations with hard-right fringe groups like the EDL and Kach Party supporters. Jonathan Hoffman proving that British Zionists have nothing to do with neo-Nazi groups, by marching with Roberta Moore of the EDL and the Kach Party. In any event, the wish to see you behind bars is less to do with your opposition to hatred of Israel, and more to do with your bloody-minded and racist enthusiasm for hatred of Palestinians. 1) They are utterly irrelevant to the matter of Hoffman apparently committing a physical assault. Hoffman raising them appears to be just the flailing, hapless ‘whataboutery’ of a short-tempered, aggressive old man who knows he is in big trouble and is angling for sympathy about a supposed ‘double-standard’. But there is no double-standard, as what Ali said is not comparable to what Hoffman allegedly did. If Hoffman did assault someone – and it would hardly be out-of-character if he did – then he has committed a crime for he which he must be prosecuted. That is true irrespective of any controversial public remarks someone else made on a different matter. 2) If you study his words, Ali was talking about corporations being responsible for the appallingly shoddy safety standards at Grenfell. That he associated them with Zionism was a non-sequitur, and made his statement sound a little idiotic by their obvious inference, but they were not inaccurate as such. So what does Hoffman think Ali can be charged with exactly? It cannot be slander, given nothing Ali said was inaccurate, even if the inferred conclusion was. It cannot be racial hatred, due to Zionism not being the same as Judaism or Jewry, and definitely not being a racial group. You see? Hoffman is trying to claim that two quite separate incidents effectively carry equal weight, and they simply do not. Jonathan Hoffman bullies, smears, threatens and lies so routinely and so instinctively that he no longer notices doing any of it. This is why, when he finally gets taken to task, he is convinced that he is a ‘victim’. Because he has simply stopped noticing the reasons why he is not. In that regard, Hoffman resembles Tommy Robinson, only even less intelligent. And yes, Hoffman, you can quote me on that. Jacqueline Walker, a black Jewish activist and long-time Labour Party anti-racism campaigner, was expelled from the party today. The story of her, somewhat-carelessly-worded-but-accurate, remarks about Jews being leading financiers of the slave trade in past centuries, is well-enough recorded that I doubt I need to go over it. If you need to refresh your memory, see here. Jackie Walker has been expelled from the Labour Party for stating historical facts. However, the reason why this is as much a stitch-up as the expulsion of Marc Wadsworth last year bears mentioning. As with the Wadsworth hearing, the disciplinary process was clearly corrupted. Walker was not allowed to speak in her own defence at her hearing, although as she had chosen to have a legal counsel present, that is not an irregularity in itself; the party rules are quite explicit that any defendant who accepts legal counsel must leave all the talking to him/her. The critical matter, which media reports of the expulsion are not making much effort to mention is that Walker, just like Wadsworth last year, was not charged with anti-Semitism. The charge that the Labour National Constitutional Committee levelled against her was Prejudicial and grossly detrimental behaviour against the party. This is taken from part of the text of Clause 2.I.8 of the Party rulebook. This charge is problematic in itself – see below – but more concerning yet is that Walker was not made aware until a few days ago exactly to which of her actions/words the charge applied. She and her legal counsel had insufficient time to prepare a full defence against some of the accusations therefore, and Walker’s wish to make an opening statement was in response to this serious irregularity. The main reason the charge is problematic is similar to the one with the charge levelled against Wadsworth last year. At his tribunal, Wadsworth was charged with Bringing the party into disrepute, a lazy, catch-all term that effectively amounts to, “The NCC can throw you out just because its members don’t like something you said or did”. While being slightly more specific, the charge Prejudicial and grossly detrimental behaviour against the party, in the cold light of day, does not appear to mean anything greatly different. It is useful as it matches words in the clause of the rulebook, so it sounds legitimate, but does so without having to give the ‘transgression’ any precise definition or clarity. Both Wadsworth’s and Walker’s charges amount to extremely blunt legal instruments. They hand an excessive amount of power to the party right-wingers who dominate the NCC, and make it much too easy for them to get rid of any member for whom they just have a political, or even personal, antipathy, on the shakiest of pretexts. Zionist organisations like The Jewish Labour Movement, The Campaign Against Anti-Semitism and The Jewish Chronicle are trying to insinuate that Walker has been thrown out precisely for being an anti-Semite, and no other reason. What they fail to explain is why the NCC needed to press such a vague and subjective charge as prejudicial and grossly detrimental behaviour in order to ‘convict’ her? Surely if they really had sufficient grounds to convict her of ‘anti-Semitic behaviour’, they could have made it more explicitly clear? All sounds very similar does it not? And all very obscure. What do all the accused mentioned on this page have in common? Well of course; they are all pro-Palestine supporters of Jeremy Corbyn. Thus it is quite impossible not to suspect that Walker’s guilt and expulsion – just like all the others’ – were premeditated conclusions. My own, much lower-profile suspension will doubtless lead to the same place in whichever century the NCC finally get around to assessing my case of implied ‘self-hating-Jewry’. But in Walker’s case, all that was in doubt was not her expulsion, but how the NCC chose to word the verdict. In the event, they took the tried-and-tested route, making it as obscure and legal-ese-precise as possible. What happened to Jackie Walker today was just history ‘rhyming’. As Wadsworth was stitched up a year ago, so Walker has been stitched up now, demonstrating just how much right-wing corruption remains in the innermost mechanisms of the Labour Party. Yesterday‘s events in the House of Commons were an unspoken acknowledgement of what has been fairly blatant for several years; Brexit just is not going to work out. Oh, I am fairly sure the UK will still be leaving the European Union by one arrangement or another, but it will go poorly, will cause more harm than good, and will not be arrived at by any course the Prime Minister has chosen. More meaningfully, yesterday was also an unspoken acknowledgement of another reality that will upset few, but worry many by the implications of it; Theresa May is now a PriMINO – Prime Minister In Name Only. Now she has lost all control over Brexit, the last vestiges of Prime Ministerial power have deserted Theresa May. May’s alliance with the Democratic Unionist Party has essentially been reduced to a bad joke, as the DUP ruled out once and for all supporting her Brexit deal. She lost three more Ministers from her rotting Cabinet – albeit junior Ministers – as they turned rebel to vote against the Government. She faces potentially as many as twenty more Cabinet resignations, and is under pressure from the 1922 Committee to schedule her departure from Downing Street for the near future. But most of all, the House of Commons voted to seize control of the Brexit process from her, a move carried by a decisive rebellion by thirty Tory MPs; the motion was carried by a margin of twenty-seven votes. Ever since her calamitous performance in the unnecessary General Election she called in 2017, May has been badly hamstrung by the Hung Parliament she blundered into being. There are all sorts of policy areas over which she has had minimal control ever since, and she has experienced some astonishingly bad defeats for a sitting Government. In short, she has barely been a Prime Minister for the last twenty-two months. The one area where she did have a position of dominance, no matter how clumsily and cluelessly she handled that power, was withdrawal from the EU. Given the enormity of that issue, it was sufficient to maintain a convincing illusion that she really is the leader of the nation. Now, at least for a few days, she lacks even that. Theresa May is therefore only a Prime Minister in name; a sort of ‘Shadow Constitutional Monarch’. She is something that malformed rules make it almost impossible for the ordinary people to get rid of, but that is also so neutered by those same rules that her mandatory presence loses much of its sting. I suggested in December that May had ridden her luck for too long, and it was sure to run out soon. Foolishly running down the Brexit clock as a ‘game-of-chicken’ with Parliament is what has drained that luck away. Not for the first time, I can almost find it in my heart to feel a little sorry for her, given the hapless, slightly-shrivelled presence to which she has been reduced. But she has to go. For all our sakes, she has to go, and her unstable, log-jammed blancmange of a Government must be dissolved and replaced with one that has function. In times as critical as these, the country cannot afford not to have a Government. It has not really had one for several years. Of course, in many circumstances, that is not necessarily a problem. But with the country on the threshold of leaving the EU, with all the troubles even a ‘Soft Brexit’ (if we are lucky) would cause, these are no such circumstances. Still, with the Tories clearly now in total despair at May’s loss of control, and at her idiotic, patronising, blame-shifting speech last week, which turned many of them against her, whispers are getting louder about a General Election being imminent. The Government has pretty much tied itself in knots. An Election is the only real answer. Everything that has happened, including the near-enough collapse of the Government, was predictable nearly two years ago. Arriving at another Election, as the only way out of the quagmire, has been predictable for at least as long. Another template readers can use for submitting e-mails to the Labour Party’s complaints team – at complaints@labour.org.uk. By any standard, implying that Jews are all capitalistic is a stereotypical allegation, and in a democratic socialist party like Labour, it should be seen as demonising too. 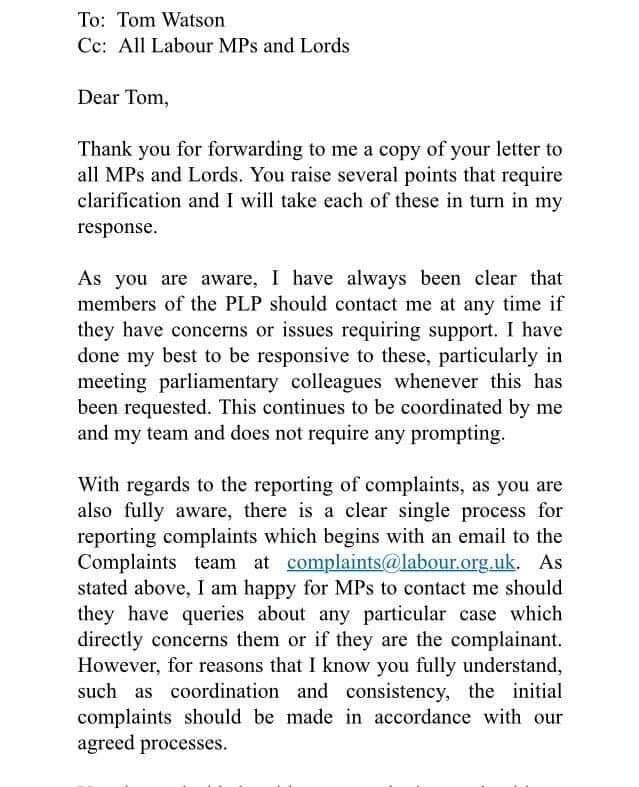 Moreover, McDonagh, when discussing the recent poor conduct of Deputy Leader Tom Watson, endorsed his illegal request for complaints to the party to be submitted through himself. This instruction is, as the General Secretary herself pointed out before the weekend, expressly in contravention of General Data Protection Regulation (GDPR) laws. For McDonagh to endorse the practice is for her to encourage it, which is solicitation. Criminal behaviour in the Labour Party, especially on matters relating directly to the way in which the party is run, cannot be tolerated under any circumstances. I therefore demand that McDonagh’s membership of the party be suspended with immediate effect, pending a full and rigorous investigation into her conduct past-and-present, with a view to her possible expulsion. This evening, a little-known former leader of Camden Council implied over Twitter that Hampstead & Kilburn’s constituency Labour Party is guilty of anti-Semitic behaviour. Sarah Hayward, wording her tweet carefully so she could deny making any libellous accusations, kicked up a stink about Hampstead CLP barring delegates from the Jewish Labour Movement from attending the local Annual General Meeting the previous evening. I shall come to the real reason why the JLM delegates were barred presently. Firstly though, I would like to suggest that Hayward should pause and consider warnings from the party’s General Secretary to the party’s Deputy Leader, which she published this evening. 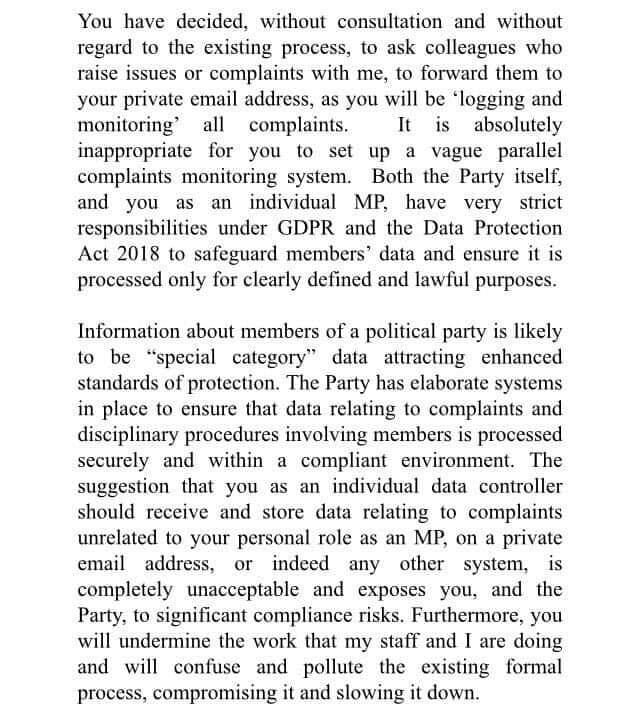 Jennie Formby’s warnings were against Tom Watson’s recent, very blatant habit of making public complaints about goings-on within the party via media, including social media, and trying – illegally let me stress – to interfere directly in the party’s disciplinary process. The reason I mention this is that, instead of reporting her concerns about Hampstead & Kilburn to Formby in the first place, Hayward simply went public with a Twitter thread that was quite insinuating, but essentially provoked anyone reading to leap to conclusions of anti-Semitism. Now, to put it euphemistically, it is quite mysterious (READ: pretty bloody obvious) as to why Haward did this as a first step, and failed to contact either Formby or the Hampstead & Kilburn CLP about her concerns. Moreover, her public show of outrage was in a Twitter thread that, again ‘mysteriously’, did not tag either Formby or Hampstead & Kilburn CLP. It is because JLM had not paid a high enough subscription for more than one delegate. It is as simple as that. Only one JLM delegate was allowed in to the AGM, and all others were barred, because one delegate at the AGM was all to which JLM were entitled. This failure is doubly curious when you see some of the replies Hayward has retweeted. As a very striking example, take this one, which Hayward seems to be using as a corroboration of JLM’s ‘martyrdom’, from Sara Gibbs (former writer on Dead Ringers, if that interests anybody) who was not even present at the meeting! Sara Gibbs being presented as a reliable witness to an event she openly admits she never even attended. 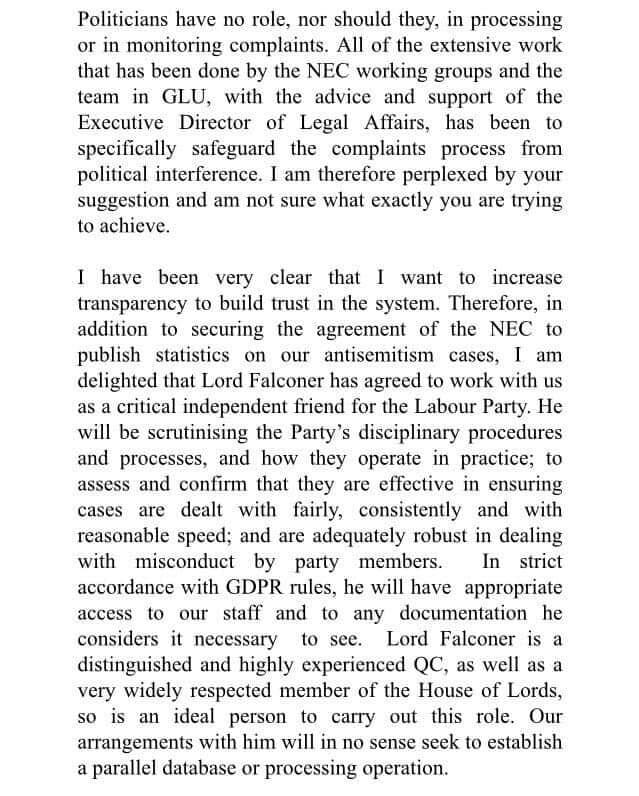 How come Gibbs’ hearsay is considered worthier of spreading far-and-wide than the CLP’s right-of-reply? This is yet more blatant trouble-making by the right wing of the Labour Party, and Hayward, while not exactly lying, has deliberately misled people, which is really just as bad as lying. And here is the big matter for me, and one that makes it so infuriating that so few people are prepared to ‘brain up’ about this endless hysteria. If anti-Semitism really is as rife in the Labour Party as people like Hayward want us to believe – and we know conclusively that it is absolutely not – why, on the few occasions when attention can be brought to specific instances of it, are so many of them clearly made up? Remember Kevin Clegg? Why do the accusers need to keep contriving examples of a problem that is supposedly ‘endemic’? I think we all know the answer to that, do we not?